It’s been an absolutely BLISTERING start to the new season for everyone at Hammer! New Equipment, New Tournament, and six days into the new season I can proudly report that we are UNBEATEN, having won 4 and drawn 3 of our opening games – a fantastic start! Without further ado, a full roundup of this week’s action follows. 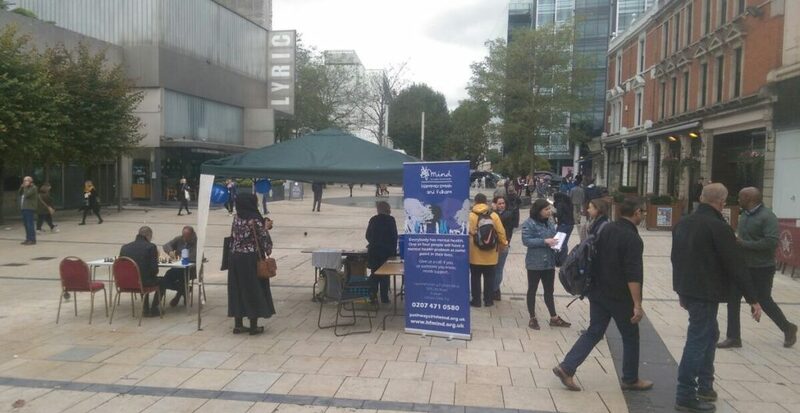 First up, we are proud to report that a group of our members lent their support to our friends at the Hammersmith & Fulham branch of mental health charity MIND, in their event to mark World Mental Health Day this Tuesday just gone. 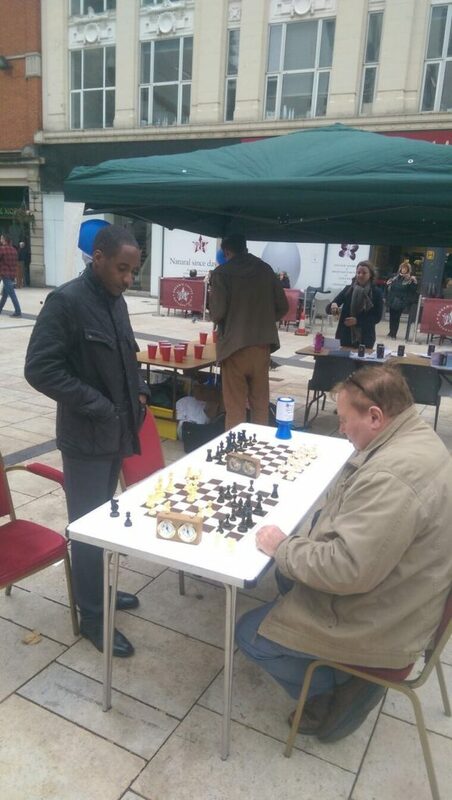 Similar to our fund-raiser earlier this year, we hooked up with the MIND folks in Lyric Square at the heart of the community to generate interest and publicity for the wonderful work MIND does, and of course play some chess! Our thanks goes to everyone involved in organising and volunteering for such a worthwhile cause! Tony Niccoli was a particular star, helping with transporting tables, chairs, sets boards and clocks, and manning the tables until 11.30am. Later on we were joined by new members Charlie and Nadim, with our heavyweight duo Marios and Mike joining later in the afternoon. And finally a surreal moment that became clear 24 hours later. During a lull in the proceedings, Marios, Mike and I played through the classic Petrosian-Spassky 1966 WCC final game involving the classic swooping Queen sacrifice. The next day on chess.com, that game was the Daily Puzzle challenge – spooky or what?? Our thanks go to Victoria and our friends at MIND, plus John, Tony, Nadim, Charlie, Marios and Mike, who gave their time to support a worthwhile cause. Hammer bossing it in Lyric Square – yet again! 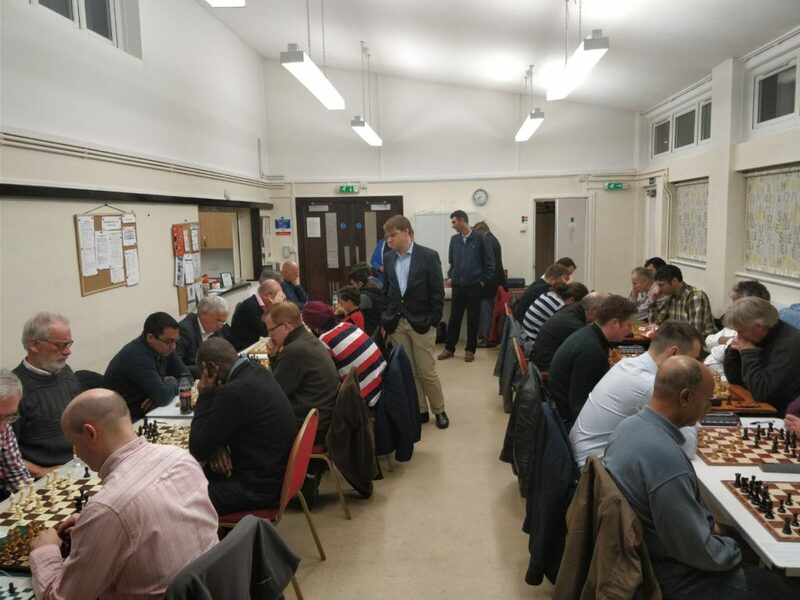 Monday 9th October saw both of our Middlesex Teams competing in their opening games of the season – it was quite literally standing room only at Lytton Hall, with a few brave souls playing casual chess on some makeshift tables right at the back of the room! Standing room only for the casual players! 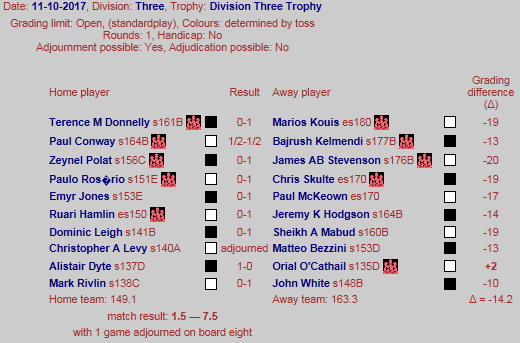 This was the first ever match for our brand new team in Middlesex Division 3! Astonishingly, 14 players wanted to play in a team that could hold 8, leaving the captain with tough selection decisions. I decided to give as many of the new guys as possible a chance to play, and rested some of the stalwarts for the potentially far harder second fixture. We ended up beating our opponents by a score of 6.5-1.5 with not a single player losing a game. Coincidentally this matches our score against them last year – which funnily enough was also the first game of the season (report here). Of course, in that case we didn’t have a second team, and put out our first team – a testament to the progression we’ve made as a club in 12 months. Dipender’s game was the first to finish. He surprised his opponent on move 1, and proceeded to play aggressively, forcing resignation in a 14-move manoeuvre. The full, brutal demolition is below! Next Monday we play host to Willesden, who join us from Division 2 last season. I expect us to be out graded across all boards, but we’ll be full of confidence following a fine first showing. 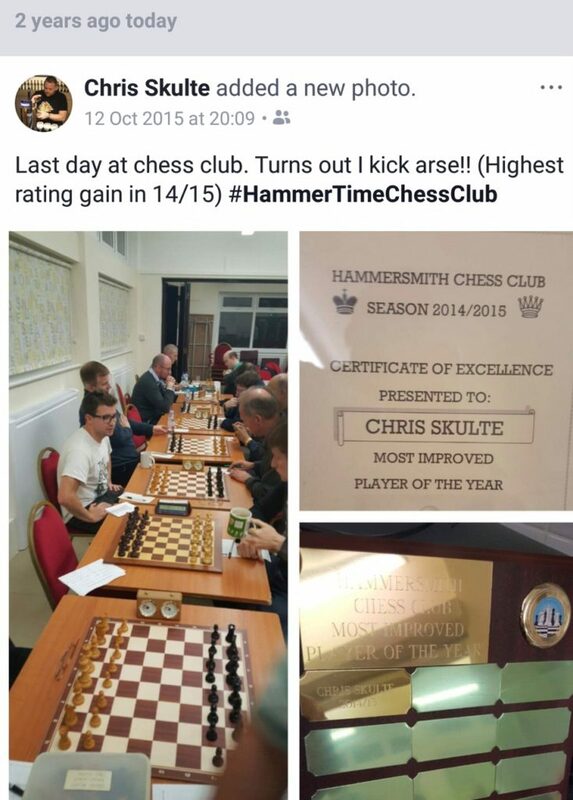 The same evening our other Middlesex team – “the 1st team”, playing in Division 2 – ran out 4.5-3.5 winners under new captain “Super” Marios. A fabulous result given the tough standard of our opponents, and another Hammer team off to a winning start this season. A great start for our “2nd team” in London Division 4 as we got off to a flyer against Morley College. It’s always nice to start the season with a win but even more pleasing when you’re able to complete the job without losing a match. We’re up 6.5-0.5 with one adjournment, and things are looking positive in that one too. Also great to see so many people battling for places. Alas, I had to knock back several players this time around, but managed to find spots for Pouya and Charlie, both of whom ran out winners on the night. John was next to strike on Board 6, putting his opponent in all sorts of trouble in the middle-game. It didn’t help that he castled the ‘wrong side’, when all the pointers seemed to suggest a King-side defence was tighter. Suddenly John’s Bishop on h2 was a monster, and his marauding c-file pawn was a menace. When a pin was sprung on his opponent’s Queen there seemed no way out short of losing significant material. John bust open the defences and finished with an elegant checkmate. Nice to watch. 3-0, and it seemed we were working from the bottom of the scoreboard upwards! Matteo secured a draw against their strongest opponent on Board 1. He was left to rue several moves that the computer considered suboptimal (always easier when checking in the pub afterwards) but in truth, there wasn’t much in it from start to finish, and in the end a draw was probably the right result. 4.5-0.5, and the match was won. Which brings us to our unresolved encounter between Nadhmi and John Williams. There looked nothing in it throughout the encounter, even following a sharp exchange of pieces that left both sides with a Knight and six pawns each. 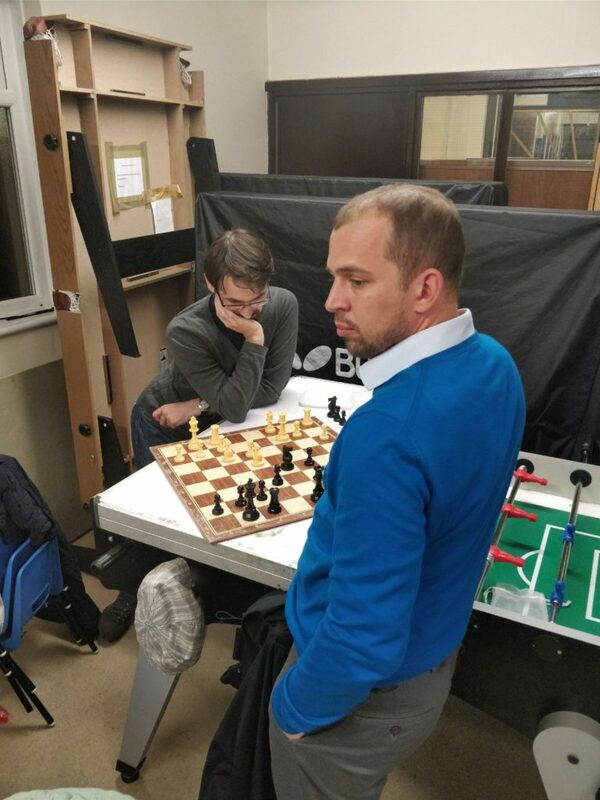 I suppose a supercomputer would say it was a theoretical draw but they played on, still several moves short of their 36 moves. Nadhmi seemed more confident in the position and forced through a passed-pawn before the adjournment came. Frustrating one, with the balance of power moving towards Master Auchi, but they’ll live to fight another day! Adjournment date TBC. Thanks to everyone for playing. Look forward to next time. In our other game this week, our League 5 team scored a 2-2 draw against Kings Head. It maintains our unbeaten run and gets a few more players out of the starting blocks! Hopefully we can squeeze out a victory next time round. The eagle-eyed amongst you may have noticed the addition of a new “Shop” link on our menu and a sponsor on the right hand side of the page. It’s a great link for both of us and has allowed us to renew some more of our equipment at a great price – watch our for more new boards & pieces coming soon! And if you’re looking for some equipment yourselves, we’ll have a stack of magazines down at the club shortly for your perusal! Saving perhaps our best result for last, and confirming our “on fire” status so far this season, London 3 Captain John White gives us his take on the opening night for our League 3 team. Welcome to the voyages of the Starship Hammer as it commences its one season mission to boldly go where??….. to Division 2 in the London League, and we don’t need 5 years!!! Okay Trekkies, that’s your lot for the moment. Yes, the new London League Division 3 season opened at a new venue – The Citadines Hotel in Holborn (not a shabby place!) – starring Hammer 1, rejuvenated, reinvigorated, packed with new and old talent and ready to take to the stage in an encounter with Hackney 3. However, before we get to the nitty-gritty please indulge your correspondent in a rewind to the end of last season and my reflections on our journey last year. I noted that we had achieved our primary objective, which was to retain Division 3 status. However a detailed analysis revealed that we had a plus score in game points and that with the odd individual game results going our way, we would have been much further up the table. With this in mind I thought a realistic objective for 2017-18 was promotion to Division 2. Our first match against Hackney 3 confirmed the logic of this. The Hammer team this season is a very different beast. Our nominated players this season are Marios, Bajrush, Jim, Chris, Paul McK, Jeremy, Pavel, Sheikh, Paul K and John G. In other words, I do not even make the team and I am the captain! First of all, I would like to welcome Jim and Paul McK to the club, and to the Hammer team. Both are very strong players and really beef up our top boards. Furthermore, the return of Chris (see below pic!) and John G is most welcome after an absence of two years. These recruits, coupled with Marios and Pavel being available for the whole season, really makes Hammer a competitive and tough nut this season. With Matteo, Brian, Orial, Safi and Adam to call on as super-subs, we have real strength in depth too. Other designations will follow as and when. Alas, Sauvignon, Spock and Dead Eye could not make the Hackney gig and thus the Suit, the Wiz and Clueless stepped up to the plate. At last to the match report. Please note: as I was playing, the details are not extensive! Hammer started at full throttle with Loco finishing his game in double-quick time. A crushing win and Hammer 1-0 to the good. There then followed a gold rush of wins as Hammer flexed its muscles. Decisive wins followed from Zeus, Sydney, Pandit, Prof, Brexit and even Clueless got in on the act putting Hammer 7-0 up and the clock had not even reached 9.30pm. I can report that all of these were decisive wins and totally in keeping with the Caveman heritage that Hammer espouses. Victory was assured. The three remaining games were in some ways the most interesting. The Wiz sadly went down and the score moved to 7-1. This was definitely a case of over-pressing with the Wiz trying to force a win. The Suit has a sealed move scenario, unfortunately in a very murky position. I am pessimistic about his chances although there are counter-play possibilities. As for Wily, what can I say? He snatched a draw from the jaws of defeat. A typical Wily game & performance. A rook imprisoned on h4, controlled chaos on the board and yet despite being a pawn and the exchange down, he was striving for the win. Wily chess requires balls of steel and his uncompromising approach always yields results. Some good, some bad! So, at the end of the night Hammer are 7.5-2.5 ahead with 1 adjournment. A successful takeoff and Hammer is ready to complete its 2017-18 mission. The force is with us!! Great to see so much chess! Thanks Andy – superb weekly report – loving the new format! Kudos to Dave and John for the excellent match reports too – let’s hope Starship Hammer successfully enters the stratosphere. Next Next post: Ave, imperator, morituri te salutant!